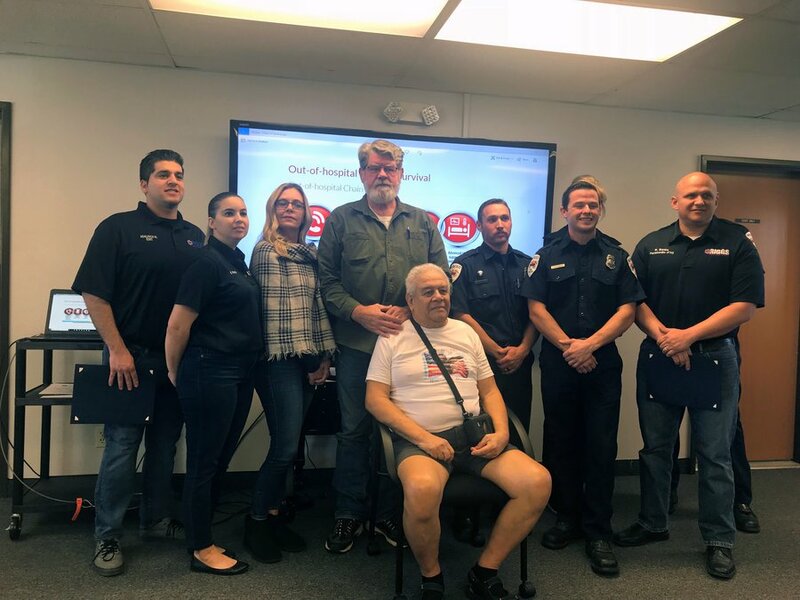 One family helping promote message of CPR readiness - CPR Educators, Inc.
Humberto “Rick” Turcios is surrounded by all the individuals who helped save his life last October when he suffered a heart attack. Emergency responders credited Turcios’ son-in-law, Ken Forgey, (directly behind Turcios) with getting it all going by starting CPR. On Oct. 21, 2018, Turcios was having dinner with his family in Planada, California. Turcios hadn’t been feeling particularly well that day, but his inner voice told him not to cancel his dinner plans with his family. It was fortunate he listened to that inner voice, because just as the dishes were being put away, Turcios had a heart attack and collapsed to the floor. Chris Mills of CPR Educators headquartered in Raleigh, North Carolina tells us that knowing what to do in the first few seconds of an emergency is critical to patient survival. “You must have early high quality compressions paired with early defibrillation” said Mills. He said that most people think that it is ok to wait for the Fire Department or first responders to arrive to do something, “that simply isn’t good enough”. “Early access to a defibrillator or AED is a must for someone in cardiac arrest” said Mills. He goes on to tell us that each second that goes by during a cardiac arrest the heart is not functioning properly and the brain is not being adequately perfused with oxygen.